NY: Dutton, 1993. FINE condition in FINE dust jacket. HARDCOVER. 1993. FIRST PRINTING. AS NEW, bound in gray and black with white wraps and red ribbon marker. Square and tight, UNREAD, original price intact. New and classic stories by forty-two writers from Isaac Babel to Eric Wright.. First Printing. Hard Cover. Fine/Fine. New York: Dutton, 1993. First edition. Fine, remainder mark, in a fine dust jacket. (5821). Octavo, Hardcover. (New York): Dutton, 1993. Fine/Fine. First edition. Remainder mark else fine in fine dustwrapper. 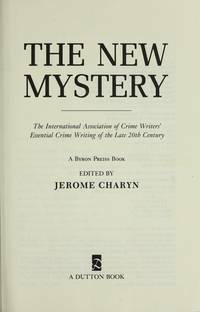 The New Mystery: The International Association of Crime Writer's Essential Crime..
NY: Dutton. Uncorrected proof of the first edition. 395 pp. Bound in plain blue wraps. Appears unread with residue and abrasion from sticker removal on upper front corner. Thus, NF-/na. Collection of short stories fromPatricia Highsmith, Walter Moslet, Sara Paretsky, Harlan Ellison, Ross Thomas, and James Ellroy among others. (9756.1) . Near Fine. Soft cover. Uncorrected Proof. 1993. Penguin Publishing Group, 1993. Hardcover. Good. Disclaimer:A copy that has been read, but remains in clean condition. All pages are intact, and the cover is intact. The spine may show signs of wear. Pages can include limited notes and highlighting, and the copy can include previous owner inscriptions. Penguin Publishing Group, 1993. Hardcover. Very Good. Disclaimer:A copy that has been read, but remains in excellent condition. Pages are intact and are not marred by notes or highlighting, but may contain a neat previous owner name. The spine remains undamaged. At ThriftBooks, our motto is: Read More, Spend Less.Dust jacket quality is not guaranteed. Penguin Publishing Group, 1994. Paperback. Good. Disclaimer:A copy that has been read, but remains in clean condition. All pages are intact, and the cover is intact. The spine may show signs of wear. Pages can include limited notes and highlighting, and the copy can include previous owner inscriptions. The dust jacket is missing. At ThriftBooks, our motto is: Read More, Spend Less. Dutton. Used - Good. Ships from Reno, NV. Former Library book. Shows some signs of wear, and may have some markings on the inside. 100% Money Back Guarantee. Shipped to over one million happy customers. Your purchase benefits world literacy! Dutton. Used - Very Good. Great condition for a used book! Minimal wear. Dutton. Used - Good. Shows some signs of wear, and may have some markings on the inside. Dutton. Hardcover. VERY GOOD. Light rubbing wear to cover, spine and page edges. Very minimal writing or notations in margins not affecting the text. Possible clean ex-library copy, with their stickers and or stamp(s).